Alexander C. Y. Huang. Chinese Shakespeares: Two Centuries of Cultural Exchange. New York: Columbia University Press, 2008. 368 pp. ISBN: 978-0-231-14849-8 (paper); ISBN: 978-0-231-14848-1 (cloth). The field of Shakespeare performance and adaptation in Asia is already a fairly mature one, with studies of Shakespeare in India and Japan well established. 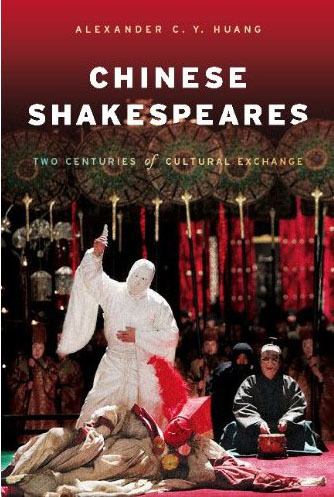 In the last decade or so, there have also been several major studies of Shakespeare in China, including Li Ruru’s Shashibiya: Staging Shakespeare in China (Hong Kong University Press, 2003) and Murray J. Levith’sShakespeare in China (Continuum, 2004), both of them excellent. My first question as I read this book was, is a further study of the topic really necessary? I hadn’t got far through the book before the answer became transparently obvious. Yes, the novelty and breadth of Huang’s approach more than justifies his treatment of this interesting and important topic. Two related main points struck me about this book. One is its contribution to theory, the other its appropriate structure. In contributing to theory, Huang does not wish simply to trace how elements of Shakespearean stories and dramas have found their way into Chinese culture through a filtering process. What he has tried to do in the book is to investigate “a central moment in Shakespeare’s afterlife and in the cultural alterity of China” (p. 23). He explores the whole notion of what Shakespeare and China both mean culturally, ideologically, and socially and considers “what the Shakespeare-China interrelations are, why they have been used to rhetorically construct narratives about difference and universality, and how such narratives have unleashed new interpretive energy” (p. 24). This book is definitely not crucially about Shakespeare in China, performances of Shakespearean plays in China and how they are adapted to suit Chinese conditions. It is about “Chinese Shakespeares,” which means identifying “the theoretical problems and multiple cultural locations of the ideas associated with China and Shakespeare” (p. 39). Questions about the authenticity of Shakespeare as performed in China may still be relevant, but they are not really central to Huang’s study. Certainly this book is a contribution to cross-cultural studies between East and West. But its approach is new and probes more deeply than earlier studies. Huang has brilliantly achieved his aims of using Shakespeare-China interrelations to study difference and universality and has indeed shown how such narratives unleash new interpretive energy. In terms of structure, the book is basically chronological, including numerous enlightening case studies. But to me more important is the way in which the period of focus of the “Chinese Shakespeares” is combined with genre, place, and meaning. The genres include the spoken drama (huaju), traditional Chinese opera, stories, and silent and feature film; the places the Chinese mainland, Taiwan, Hong Kong, and various Chinese diasporic communities. As for meaning, that includes a whole range of issues that have pressed themselves hard on Chinese society and politics at various times over history. Locality and time both matter in this book, with the whole notion of Chinese-Shakespearean interactions being a fluid one that may change in meaning in different times and places. I give two examples to illustrate the way Huang has structured this excellent book, which also tells us something of his theoretical approach. The chapter on the early decades of the twentieth century gives some attention to Shakespeare in silent film. At the same time it takes up the theme of “womanhood” at a time when women’s and feminist issues were receiving increased priority among progressive thinkers and the educated elite. And within this theme Huang gives an interesting and enlightening discussion of the silent film The Woman Lawyer based on The Merchant of Venice and premiered in 1927. For the chapter on the 1980s, the genre given precedence is the xiqu. This term means the 300 and more regional styles of Chinese traditional drama, and especially thejingju (often translated Peking Opera or Beijing Opera), the one that emerged as by far the most “representative” and certainly produced the greatest and most famous actors. Deng Xiaoping’s 1980s opening up of China saw various productions of Shakespearean plays as xiqu, traditional theatre having been almost entirely suppressed during the Cultural Revolution of 1966 to 1976. Huang’s main example is Othello (Aosailuo) in the form of jingju, which premiered in 1983 but was replayed as part of a major Shakespeare festival in China in 1986. The ideas and the interpretations in this book are so rich that I forbear even to attempt big generalizations about them, beyond saying that I admire the effectiveness and clarity of Alex Huang’s argumentation. I take up two related issues that seem to me both interesting and important. In both cases, Huang’s arguments are interesting but I believe subject to interpretations different from his. One is the issue of anti-Semitism in what we might call “Chinese Merchants of Venice.” In discussing The Woman Lawyer, Huang rightly emphasizes the gender question. The film keeps the settings and characters of Shakespeare’s original, but excises references to Christianity and Shylock’s Jewishness. Huang comments that The Merchant of Venice was the first Shakespeare play to be staged both in mainland China and Hong Kong and that “what is singular is the way in which the Chinese overlook the racial and religious tensions in the play despite changing historical circumstances” (p. 115), even after the Holocaust and after European Jews fled to Shanghai en masse. Though he does not directly say so, his discussion gives me the impression that he sees something slightly racist about the ways in which ChineseMerchants of Venice have shied away from the issue of anti-Semitism, especially since, in the new millennium, Anglo-European interpretations of The Merchant of Venice are “even more dominated by a post-September 11 awareness of racial and religious tensions” (p. 116) than before. Of course I can see what he is driving at. However, it seems reasonable to me for the Chinese to emphasize issues of crucial importance to them, and I don’t see the need for them simply to follow interpretations in the Anglo-European world. After the end of World War II, Japanese behavior in China, of course, loomed much larger than the Holocaust. As for the post-September 11 world, there are certainly religious and ethnic tensions in China, but that doesn’t obligate the Chinese to emphasize them in producing or adapting a Shakespearean play. Ma Yong’an who played Othello in the 1983 Aosailuo was a famous hualian (“painted face”) actor. His painting his face black for the role was based on jingju aesthetics, but was innovative in developing a new facial pattern, one adopted as a sign of racial difference. Huang is rather critical of Ma’s innovation on a variety of grounds, including that “black people have often been discriminated against in China” (p. 178). While this is true, it seems to me possible to be a little too ideological in such matters. I regret that Chinese Shakespeares lose out both ways: they get criticized both for avoiding the issue of race (The Merchant of Venice) and for giving it weight (Aosailuo). The scholarly appurtenances of this book are excellent. The notes are extremely learned, some of them taking on quite important points of scholarship. The bibliography is long and complex. It includes primary sources, items in Chinese and Japanese, and those in European languages, the latter mainly in English but with a few in French and German. All this of course adds to the scholarly effectiveness of this book and shows the author’s ability to sustain a complex line of reasoning based on a wide range of source material. The illustrations are varied and interesting and their quality is good. Huang has obviously taken a lot of care over the choice of the pictures, as well as the captions. The result is to make the pictures really add to the interest and meaning of the text. And one should mention the very striking, graphic, and rich cover image, which shows the mousetrap scene in Feng Xiaogang’s feature film The Banquet (Ye yan, 2006) loosely based on Hamlet. One of the most interesting appendages to the main text is a “select chronology” from 1596 to 2008 that includes historical events, “worldwide Shakespeares” and “Chinese Shakespeares.” Of course it is fascinating to read that Hamlet was already performed in Socotra in the Gulf of Aden as early as 1608, well within Shakespeare’s life time. But perhaps more important is the juxtaposition of events like wars and earthquakes with Shakespearean productions, either in China or elsewhere. Of course the events noted are highly selective, elucidating the material and ideas in the book. A piece of particularly useful information is offered under “A Note on Texts and Translation.” Readers interested in viewing videos, stage photographs, rehearsal notes, scripts, and other materials related to performances discussed in the book will benefit from the open-access digital video archive “Shakespeare Performance in Asia” that Huang co-founded and built. Overall, this is a splendid book. It is well written and illustrated. It adds to our understanding not only of Shakespeare but of theatres in various parts of the Chinese world. Highly infused with theory, it adds to our understanding of the ways in which great cultures interpenetrate and enrich each other. It is a truly path-breaking book. I recommend it strongly not only to all those interested in Chinese culture but those interested in theatre and drama and the many ways in which the performing arts inform societies and cultures.